Ugh, TEST PREP! 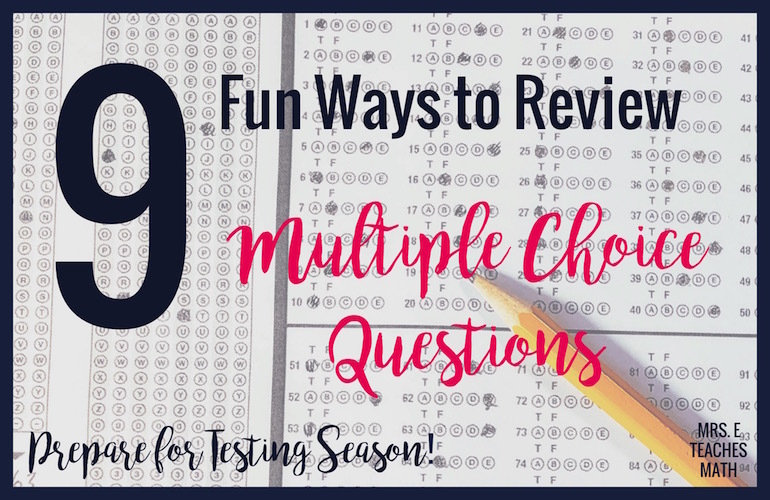 With state testing looming, students NEED practice with multiple choice questions. Multiple choice questions are bor-ing, but practicing doesn't have to be! 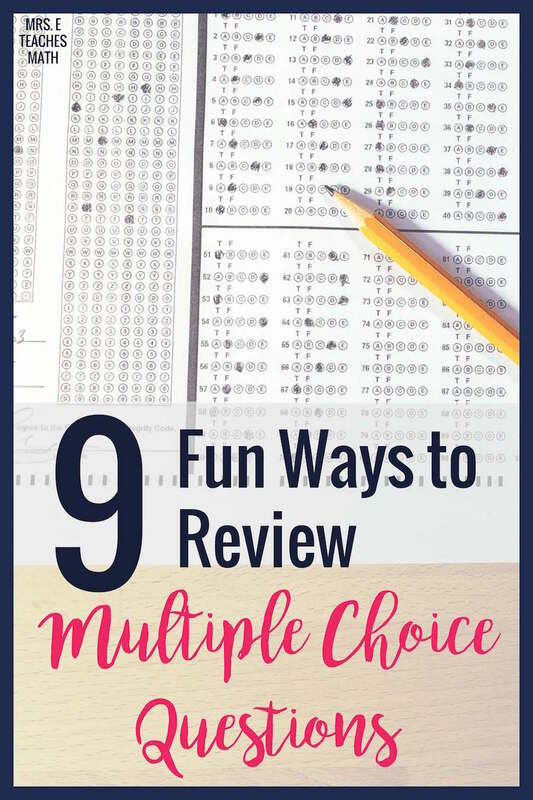 These 9 ways to review multiple choice questions might just be the ticket to keep your students engaged in class. If you want to have students to have a copy of the questions, make a class set. Then, put the pages in page protectors. You could have students "race" to see who can get the most correct answers in a certain amount of time. I've used cheap sheet protectors in the past, and they have worked fine. If cost is an issue, I prefer these page protectors. However, if you want something to last more than one school year, I highly recommend these awesome dry erase sleeves . Stations mazes are great because they get students up and moving around the room. They also encourage students to check their work carefully since an incorrect answer will eventually send them back to a problem they have already solved. Successfully completing a maze requires students to slow down and check their work. Best of all, they require NO PREP and are READY TO PRINT! This actually reminds me of "popcorn reading" from when I was a student. First, the teacher POSEs a question and PAUSEs for at least 5 or ten seconds. The pause needs to be long enough for most students to come up with an answer. Then, the teacher POUNCEs on (chooses) a student at random to answer the question. Once the student has answered, they BOUNCE to another student to ask them "What do you think of my answer?" 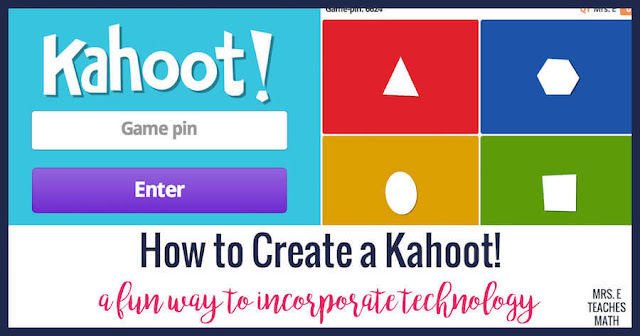 If you're wanting to incorporate technology, Kahoot is a fun game for students. It's great for students to practice speed. It would also be fun for students to work in teams to find the fastest team! Give each student a set of four cards. Each card has a different letter (A, B, C, and D). Display the questions on the board and have students (or groups of students) hold up the card for the correct answer. You could also change it up by doing this for true and false questions or always, sometimes, never questions in geometry. If you would like your own set of ABCD cards, you can download a FREE set at the bottom of this post! This activity takes the ABCD cards a step further. Each corner of the room can be labeled A, B, C, or D. Then, a question is read and students move to the corner of the correct answer. You can also randomly call on students to defend their answers from the different corners. 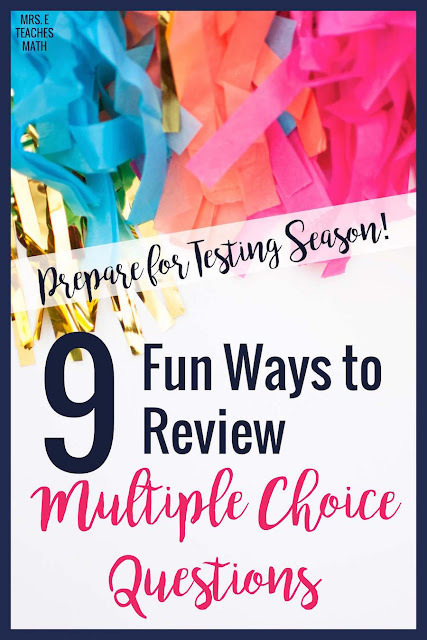 Have students to write test questions with multiple choice answers, in a format consistent with their state exams. Challenge students to come up with good distractor answers. Students will have the opportunity to evaluate the course topics, reflect on what they do and don't understand, and determine good test items. As an extension, students could trade questions and answer each other's questions! I like to buy the giant bags of Jolly Rancher candies and pass them out to students that are correct. You can get a great deal on huge bags of Jolly Ranchers on Amazon. Grading multiple choice practice doesn't really involve much critical thinking on the student's part. However, if you give a student a completed quiz that another "student" has taken and tell them "Six of these answers are wrong. Find the mistakes and correct them." there is much more critical thinking needed for the student. Make your students grade so that they will more deeply consider all the content! Have you heard of Plickers? The website provides you with a free set of cards you can print. Each card has its own unique barcode. You can ask students for responses to multiple choice questions during class and you can scan the room with your phone to determine how many students answered correctly, as well as other statistics. I hope some of these tips will help you and your students make it through this test prep season! I know review time can be a huge challenge! Download your FREE Set of ABCD Cards! Are the ACBD cards available somewhere else on your site? BTW, thank you for sharing your resources. I cannot wait to use them to review with my students for testing. The cards are available on a link above. Right above my blue signature, there is a pink link where you can get the cards.